We are a local nonprofit agency that is part of a national network of organizations and individuals committed to improving Hawai‘i’s maternal, child and family health through collaborative efforts in public education, advocacy and partner development. 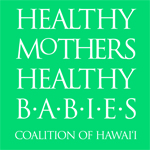 Healthy Mothers Healthy Babies Coalition of Hawaii is committed to ensuring women and families receive access to resources and information before, during and after pregnancy. We are committed to providing programs and information that help women achieve a healthy, safe pregnancy and nurture a healthy baby.